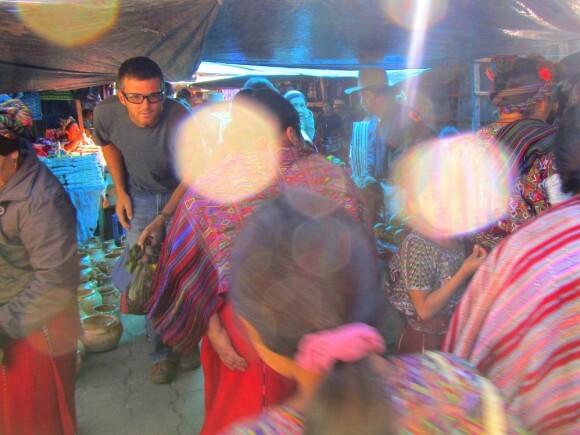 As we walked through the weekend market in Nebaj, Guatemala, I continuously glanced over my shoulder, searching for my honey. These types of markets aren’t made for large people. 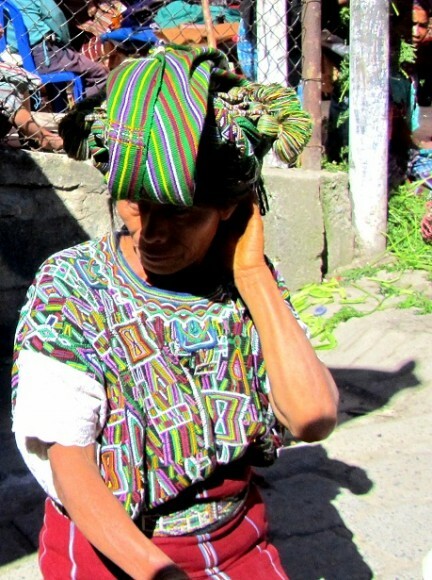 The rule of survival of the fittest has alienated any shopper of non-Mayan descent. Watching Brad attempt to maneuver through the crowds was painful, his sheer height at 6’3″ made it necessary for him to walk with a bend at the waist and in a low crouch. Even still, his head skimmed the tarps strung above the stalls and walkways. Women continuously side shuffled around him, sucking him into a black hole that he couldn’t release himself from. Every other shopper walked effortlessly, head held high, baskets atop, and holding live chickens under their arms. 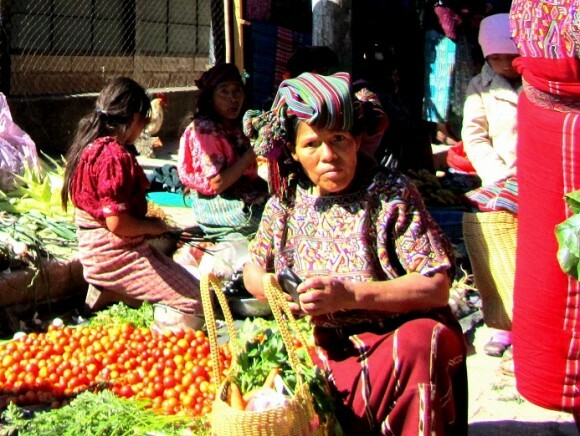 The Nebaj market was mesmerizing, not only for its people but for its food selection. Large plastic rice bags sat plump on the floor and tables, sides rolled down, level with the dried goods inside. Grains, dried chilis, spices, flour, beans, green coffee beans, cocoa beans, cocoa nibs! Every stand had a different selection of fruits and vegetables piled high; heirloom tomatoes, juicy beets, yucca, carrots. I hand selected my tomatoes and piled them into a bowl. Methodically, the bowl was placed on one end of a weighing scale by the vendor. Holding the scale up high from the middle, the small-framed lady eyed it with concentration, throwing a few more tomatoes in until level with the one kilogram weight (a bag of rice) on the other end. On the way out, a group of women worked a tortilla stand. I watched as they broke off a ball of dough, smashed it between their palms, pinched the edges to perfection and threw the patties on the skillet. They looked a little different than the standard corn tortilla. Ah, sweet tortillas made of plantain. That was a new one. We bought a dozen and off we went. Brad breathed a sigh of relief as he stretched out his back. 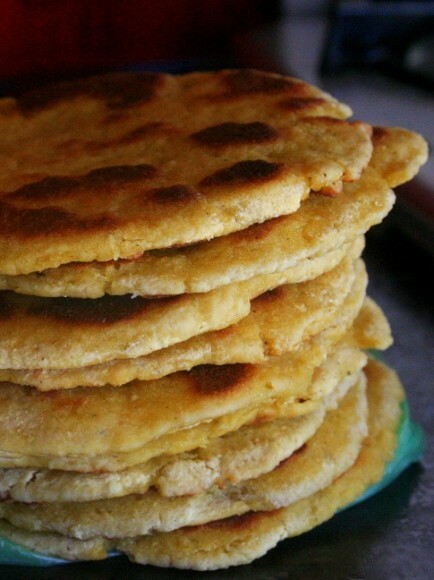 Much of the Guatemalan food came as no surprise, with masa continuing to be the staple, served with meat, rice and beans. We did, however, run across some delightfully new dishes. While in Antigua, we often went to the local market for lunch. While there were plenty of restaurants and cafes targeting the tourist crowds, the local market was where it was at. As we walked down a row of food stands, people leapt out from every corner, blocking the walkway for as long as we would permit them, all the while shouting out the meals of the day. One young lady spoke so rapidly that I quickly became hypnotized, my eyes locked on her bulging neck vein, ready to rupture from the physical endurance of nonstop announcing. Her voice however did not lure us in as much as the visible popularity of the restaurant. Two long benches stretched parallel to each other, packed with local families and workers. As a Mexican once told us, if you don’t know which local joints are good, just look for the locals and go there; you are guaranteed good food and affordability. Here we had the pollo en pipian, chicken in a tomato-pumpkin seed sauce, a local Antiguan dish for $1.50. 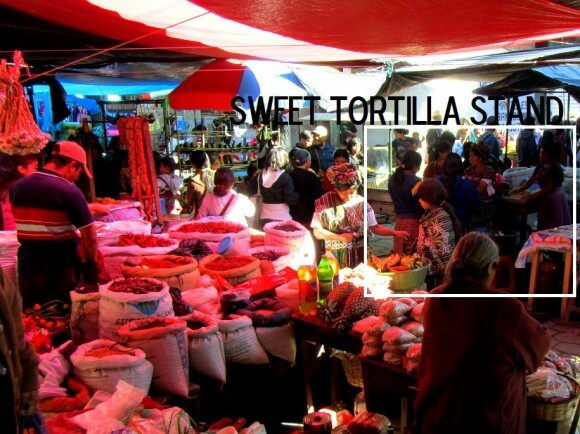 In the same market on a different afternoon we had chile rellenos. These were much different than the spicy Mexican chili rellenos we’ve experienced, usually composed solely of cheese inside. 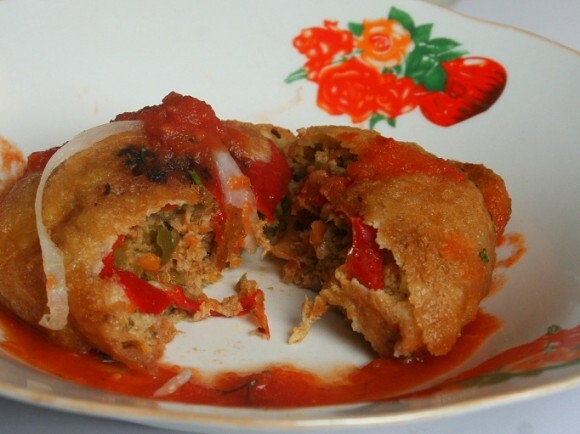 Guatemalan chile rellenos were on the lighter side, without cheese and stuffed full of finely minced meat, carrots, green beans, and spices. They were then covered in egg batter, fried, and served with a tomato sauce on top. During the craziness of Semana Santa, we came across a church with hundreds of people pouring through the arched entrance. Inside was a hidden comedor area with dozens of food vendors. I presumed, based upon the organized groups of purple robed men, that it was one of the staging areas for the processions. 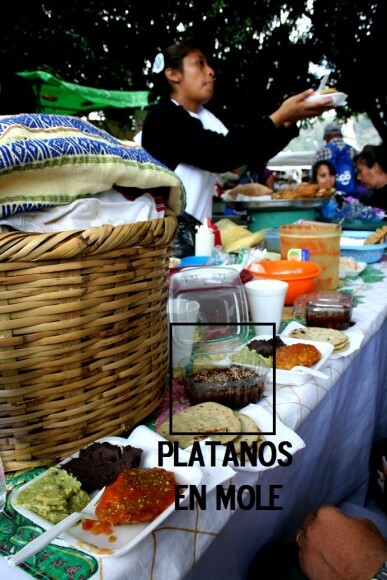 Here is where I discovered platanos en mole. Heaven! The last gastronomical wonder of Guatemala were the licuados, a frothy blend of fruit, ice, and water or milk. While it may sound just like a smoothie, it most definitely is not. Licuados are lighter and thinner in consistency. Only a little bit of ice is added to make them cold and a little thicker, all the while creating a frothy top with flavorful liquid at the bottom. Rinse chicken and cut garlic head in half crosswise. In a 6-quart kettle cover chicken, garlic halves, onion, coriander, salt, peppercorns, and allspice with water and simmer, covered, 1 hour, or until chicken is tender. Transfer chicken to a bowl to cool and reserve stock. Heat a large heavy skillet over moderate heat until hot and toast pumpkin seeds, stirring constantly, until they have expanded and begin to pop, 3 to 5 minutes. Transfer seeds to a plate to cool. In skillet heat sesame and cumin seeds, allspice, cloves, and peppercorns, stirring, until fragrant, about 1 minute, and transfer to plate. When seeds and spices are cool, in an electric spice/coffee grinder grind mixture in 4 batches to a powder. If using fresh tomatillos, discard husks and rinse with warm water to remove stickiness. Stem serrano chilies. In a saucepan simmer fresh tomatillos and serranos in salted water to cover 10 minutes. If using canned tomatillos, drain them and leave serranos uncooked. Transfer tomatillos and serranos (use a slotted spoon if simmered) to a blender and purée with onion, garlic, 1/4 cup coriander, and salt until completely smooth. In a 5-quart heavy kettle simmer tomatillo purée in lard or oil, stirring frequently, 10 minutes. Add 2 1/2 cups stock and stir in powdered pumpkin-seed mixture. Simmer sauce, stirring occasionally, 15 minutes, or until slightly thickened. Sauce may be prepared up to this point 1 day ahead and cooled completely, uncovered, before being chilled, covered. Roast and peel poblano chili. In blender purée poblano with remaining 1/2 cup stock and remaining 1/4 cup coriander until completely smooth. Stir poblano purée and chicken into sauce and heat on top of stove or in a 350° F. oven until chicken is heated through. Garnish chicken with pumpkin seeds and coriander and serve with tortillas. Roast the chllies on a hot place or under a grill the skin burns a little, place them in cold water and peel the skin off, cut down the middle and set aside. Place the carrots, beans and potatoes into a food processor and pulse until a rough paste. Place in boiling water for 10 mins or until just soft. In a large pan heat some oil with a finely chopped onion and add the mince, stir for a few minutes till brown with the thyme. Once browned add in the strained vegie mix and cooking for 45 minutes with the stock and salt. When the mixture has a consistency good enough to roll into balls, it is ready. Press the mixture in your hands to make long football shaped balls to go over the chili pieces. Separate the egg whites and whisk until soft peaks form then fold in the egg yolks, dip the chillie balls into the batter and shallow fry in some hot oil. They should only need about 30seconds each side. Serve with some fresh tomato sauce. If using pasilla chile, soak in water 15 minutes, remove seeds, finely chop, and set aside. In a nonstick or dry skillet, combine pumpkin seeds and 2 teaspoons of the sesame seeds. Cook over medium heat, stirring, until lightly toasted, 1 to 2 minutes. Transfer to a bowl and to cool completely. In a separate bowl, combine chocolate and hot water and stir. In a blender or food processor, combine chopped pasilla (or chile powder), toasted seeds, chocolate mixture, tomato, tomatillos, cinnamon sticks (or ground cinnamon), sugar, and salt. Process several seconds until well blended. Set mole mixture aside. In a large skillet, heat oil. In batches if necessary, cook plantain slices on both sides until golden brown. Drain on paper towels. Pour out all but 1/4 cup oil from skillet. Cook, stirring constantly, over medium-high heat for 8 to 10 minutes. Add breadcrumbs and stir until mole has thickened, 1 to 2 minutes. Top plantain slices with mole and sprinkle with remaining 1 teaspoon sesame seeds. Place all ingredients in a blender or food processor container. Blend 1 to 2 minutes, until smooth. Drive on! Started following a week ago and i’m thinking you are having a grand adventure. I work on old VW’s. If i can help with an idea or anything, please ask! Be careful and have fun. Hey Guys— Just wanted to say I really appreciate the nice variety of information you’re providing on your journey; you both write beautifully, and differently! Whoo-Hoo! I loved the types of food we encountered on our world trip. I am really curious though, how did you get the recipes? I’m really impressed! @ James: kind of funny, I wasn’t sure what chuchitos were so I searched in google images “chuchitos food costa rica”…..and Ms. Lauren popped up twice in the first 10 images! Yes, we did have them – delish. de mi punto de vista hay varias manera de viajar y tu has optado con una de ellas …………. te felicito !! !